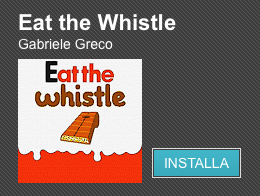 As subject says Eat the Whistle is now available on Google Play Store. According to Google it supports more than 2000 different devices. The game is free, but with in game advertising (a small banner on the top of the screen). There is an in-app purchase of 1 euro that removes the ads forever. There are endless studies that explain with tons of data from apps available in both stores from years that the Android users are less confortable using a credit card on their device than the iOS users. This may be related to the less security that the Android devices have dued to the fact that Google does not check malicious apps in advance. So many indie developers suggest to release apps in Android that are at least initially free, and it's the case also of one of the most downloaded Android app, Whatsapp. So Android users will get the full ETW experience for free, with a small banner on the top of the screen.